Whether you need new stainless steel railings for your home or office, Pro Weld is the Toronto company to come to. We have over twenty years of experience in the custom steel welding and manufacturing business, and are proud to serve clients all over the Greater Toronto Area. Why stainless steel? 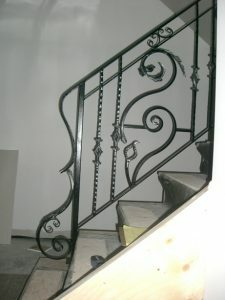 We also manufacture and install railings made of wrought iron, glass, aluminum, cast iron, and mild steel. Each material, of course, has its own unique qualities and is better suited to some applications more than others. At Pro Weld we are committed to providing all our clients with honest, accurate information with which you can make informed decisions and investments. The following are seven key facts about stainless steel railings. Stainless steel is actually a generic term for a range of alloy steels, all of which are corrosion-resistant. They all contain at least 10.5% chromium. The composition of stainless steel railings results in the formation of a chromium-rich oxide film on the material’s surface – it is this passive layer, in fact, that provides stainless steel with its resistance against a wide range of corrosive agents. Furthermore, this thin film is self-repairing; the presence of oxygen in the air enables it to continually restore itself after scratches, abrasions, cutting, and other minor damage. There are over a hundred and fifty grades of stainless steel; the alloys’ compositions differ depending on their intended final application. Therefore, it is important to purchase stainless steel railings from a reputable Toronto manufacturer, in order to ensure that you get high-quality stainless steel that is of the ideal grade for its given purpose. Often more than one grade of stainless steel will be available, so ensure that you find out as much information as possible during your initial consultations; this will enable you to make a good decision. Stainless steel railings are known for their incredibly high tensile strength, plus their long-term durability. They are weather and corrosion-resistant, practically rust-proof, and ultimately very affordable, given their long life span. The strength and durability of stainless steel is the reason why the material is used for such a wide variety of applications, including railings, home appliances, cutlery, architectural design, bridges, surgical instruments, and industrial equipment, just to name a few. In addition to its strength and other technical properties, stainless steel is also a material of choice due to its aesthetic qualities. First of all, if you choose stainless steel railings, you know that they will always look clean and polished. Secondly, being very malleable, the material allows for a huge range of design options when it comes to creating and manufacturing stainless steel railings – no matter whether they are for home use, industrial use, or commercial use. If you come to Pro Weld, our engineers and designers will work closely with you to achieve the precise style that you want – whether you are interested in a look that is contemporary or classic, or one that incorporates intricate patterns or clean lines – just name it and we will help make it happen. One of the huge pluses of stainless steel railings is that they are entirely easy to maintain and keep clean. This fact is the reason why stainless steel is used so often in hospital and kitchen environments, and in pharmaceutical and food processing facilities. The same thin film on stainless steel that keeps rust at bay, also renders it impermeable. Basic cleaning can be accomplished by simply using water and a soft cloth, although you should make sure to properly dry your railings to prevent water spots; certain minerals left by the water may leave marks on the railings. If necessary, soap or a glass cleaner may be used to get rid of tougher dirt and stains. Finally, if your railings get particularly worn, scratched, or stained, a specialized stainless steel cleaner may be necessary – but this situation is rather unusual. Customers often ask us if stainless steel railings are an environmentally-friendly choice. Well, the answer to that is a resounding “yes”. How so? Firstly, stainless steel production today incorporates a high percentage of scrap metal (at least 50%). Furthermore, stainless steel itself is 100% recyclable. Many of the stainless steel products that we are using today have previously been a part of other great stainless steel items in the past. Today, while there is a very high rate of stainless steel being recycled, some of it still inadvertently ends up in landfills. In the event of this happening, the steel has no negative effect on the soil, emitting no toxins or other harmful substances. The adaptability of stainless steel is not limited to the material itself – in terms of architectural design, stainless steel railings can be fabricated in combination with other high-quality materials. This makes available an even wider range of hybrid, contemporary design options. Options like glass inserts, bars, or cable systems can be utilized, each of these creating an entirely unique look and feel in your space. Pro Weld is committed to quality in everything that we do – from our materials and manufacturing to our designs, installations, and customer service, we only provide our clients with the best. All our products meet or exceed professional standards, and we are a member of the Canadian Welding Bureau (CWB). This means that we have certified supervisors on hand at all times, and that all our projects meet extremely strict standards and guidelines. If you would like to find out more about our stainless steel railings or the other products that we offer, give us a call today! We are also happy to provide you with free quotes upon request.